With a full conference registration, access to any pre-conference activities is permitted on Monday, June 24 as well as Business Lab, all speaker sessions, meal functions, evening receptions, the Business Fair, and the Tribute! Reception and Dinner (excluding invitation-only functions). 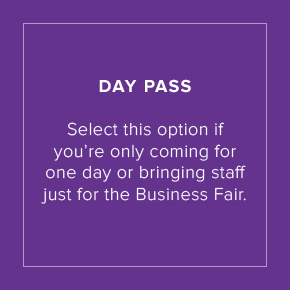 Each Day Pass includes admission to all events that on occur on the day for which the pass was purchased (excluding invitation-only functions). Tuesday Day Pass includes admission to all general sessions, Business Lab, meal functions and the Welcome Reception and Silent Auction on Tuesday, June 25. Wednesday Day Pass includes admission to the cafe, meal functions, the Business Fair and the evening event on Wednesday, June 26. Thursday Day Pass includes admission to all keynote sessions, Business Lab, meal functions and the Tribute! Dinner on Thursday, June 27. Note: Sponsors & Exhibitors can purchase 3 additional Exhibitor Day Passes for $250. Companion Passes are available so attendees with Full-Conference Passes can bring a guest to an evening event if they are traveling with a spouse or friend. The Companion Passes are only needed for guests who are not attending the daytime conference activities. Any individual who has a Full-Conference pass or a Day Pass does not need to purchase any additional passes for themselves in order to attend the evening events. Attendees can register onsite in Baltimore from June 24-27 for a Full Registration or Day Pass. Both exclude access to invitation-only functions. All registration/ticket sales are final, no refunds will be issued. All exhibitor and sponsor package purchases are final and non-refundable. Paid registrations may be transferred to another individual at your organization if you notify WBENC in writing by June 14, 2019. Send transfer and substitutions via email to wbenccustsvc@wbenc.org. Please include complete contact information for yourself as well as for the colleague who will be using the registration. All requests must be made in writing by June 14, 2019. Registrations may not be transferred to future WBENC events.